By magnetic resistance from alternate interposition of a non-magnetic conductor between the magnets and armature. 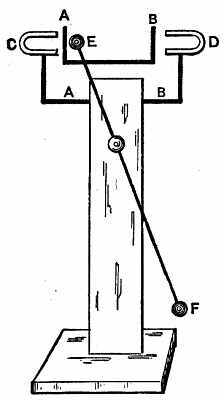 F, pendulum, E, armature, C, D, magnets. A, B, neutralizing substance moved by the pendulum to a closure between the magnet and armature at the end of the pendulum stroke, alternately, so that the opposite magnet will be in force as the armature swings toward it. Claimed, but not yet found.